Help advocate putting in measures to stop North Yemen from invading South Yemen again before advocating measures against the Arab Coalition. Southerners need to be included in peace talks. Up to now southerners have been excluded from being apart of any peace talks. Help advocate for this. 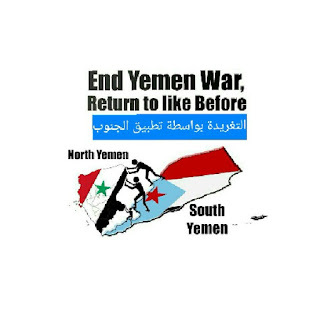 South Yemen to have the human right to self determination as part of any peace deal and a timed plan to exercise this right. Follow @SouthHirak on Twitter for information on #SouthYemen. Donate tweets to help with raising the awareness. After the war of 1994 the south was seen as "spoils of war" and the elite of the north can do to the south as they please. So Saleh and his allies from the Islah party (Muslim Brotherhood, Alqaeda) began a campaign of assassinations of southern leaders, military officers, and activists. After the campaign of assassinations, thousand of military checkpoints were set up throughout the south and were ordered to kill and/or imprison secessionists. Also, former president Ali Abdullah Saleh and his allies from the Islah party (Muslim Brotherhood) settled and financed Alqaeda (AQAP) in South Yemen in order to subdue southerners and keep South Yemen in shambles while northern security forces enforced the full occupation of South Yemen and Saleh and his allies looted southern land and resources. 46 governmental and public sector institutions and establishments were forcibly seized by the northern security forces, including the Monetary Authority and the General Establishment for Flour Mills. More than 28 southern-owned factories were appropriated by the northern government, including manufacturers of textiles, dairy products, and agricultural equipment. That's on top of constant cold blooded killing of of unarmed civilian southerners and attacks on southern cities and villages by northern forces. Before the 2015 war over 20,000 southerners were killed & over 200,000 imprisoned in 2 decades. After years of patients and hope for prosperity in 2007 The Southern Movement known as Al-Hirak was established demanding secession of South Yemen from The Republic of Yemen. The goal is liberation and independence. Southerners took to the streets in peaceful protest saying: enough is enough. Southerners were not only seeing themselves being marginalisation by the north - both economically and politically but their land being raped back into the stone age. Northern culture brought rampant corruption, poor governance, poverty, regional rivalries and religious differences which was not present in the south before unity. The big divided in cultural ideology can still be seen today. Northerners have this secession phobia. Their dependency on the south at any expense can still be seen today even after all that has happened in 2015. Like in 1994, in the early part of March 2015 Ali Saleh's northern yemeni forces entered South Yemen to reinforce its unity by force. Only this time the houthis were the sidekick rather than the islahis. Islahis were supportive of the coup before Decisive Storm. Southerners from the Southern Movement formed the Southern Resistance (SR) with the blessing of the Yemeni President Hadi. Southerners seen this as an opportunity to prevent the invasion and achieve independence rather than protect unity. Limited to side arms and kalashnikovs SR bravely fought the coup. While northern forces had heavy artillery, unsuited to protect a country from invasion, but more to ensure control over its own civilians, particularly in the south. A battle of David and Goliath. Before the coalition got involved SR was successful in slowing down the coup forces with many brave soles martyred in the process. As a result coup forces finding themselves limited, they fired at civilian southerners indiscriminately, resulting in massacres with significant proportions of children, women and the elderly being killed. Yet the SR were persistent and continued to strive. Although the Arab Coalition forces involvement was not to help free South Yemen, it did saved lives in South Yemen, like NATO saved lives in Bosnia. Had coalition forces not stepped in on 26th March with air support, we would be talking about a genocide rather than the massacre of southerners. Air support hindered North Yemen coup forces from carrying out the intended genocide and limited them to indiscriminate shelling of homes and anything that moved. The coalition's involvement strengthened SR chances of achieving control, which in turn revived believe in southerners in restoring an independent South Yemen. Many will tell you that it's a war of sects and regional differences. The reality: what sparked this war was southerners response to the coup invasion who had been humiliated to point where this war was a blessing for them to turn what was a dream into a reality. In hindsight, had southerners been given the right to choose their own destiny, would there be a war today?. Marib being the expectation, coup forces took the whole of the north without a single shot fired. The Coalition wouldn't have taken Aden or any part of the south without the Southern Resistance. The Coalition wouldn't have got involved if south did not resist, like the north did not resist. The vast majority of northerners and their sympathizers will always deny and suggest different than this war being about the north reinforcing unity. No northerners assisted southerners with their resistance. Clearly showing how southerners have no value. Only after the Coalition intervened, the only governorate that initiated a resistance was Taiz. There is an argument of whether this resistance is not representative of Taiz majority. Unlike the south, It only formed after coalition intervention, because only then they could see some benefit from fighting. When SR and Coalition recaptured Al-Anad over a third of the POWs were from Taiz. 62 of the 152 captured were from Taiz. The rest of POWs were from all other parts of the north. Only 22 were houthis. Is Taiz resisting or a party of the coup. The numbers captured shows they played the biggest part in the coup. Had the south been allowed to choose it's own destiny following the 1994 war, Ali Saleh would not have had any reason for northern people to see the need for him to stay in power. The south was the spoils he brought to them. The vast majority of northerners are party to this ideology. Ali Saleh held power by holding the south. A position and power he clearly still wields today and for the same reason. So people can say what they want, the reality is: there would be no war without forcing unity on the south. 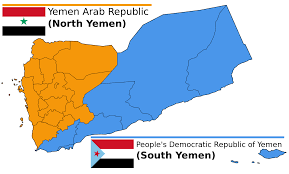 The reason why this war is dragging on right now, is due to middle Yemen, knowing if they attack their unity allies further north, the forced unity is surely dead. They are sitting on the fence and biding their time hoping for some sort of miracle to stop southerners getting independence. Your reading this today and asking yourself, how come i didn't know about the South Yemen thing? Now think about how oppressed southerns are, they have been excluded from every walk of live to a degree you wont know they existed. North Yemen has nearly three decades of networks, contacts.. that it has built, which it is using successfully, manipulating the media to the extent they count the number of kills they committed themselves on southerners, as their own deaths and committed by the Coalition. What will happen when the Arab Coalition resolve their differences with North Yemen? Southerners know too well this means they have the green light to turn their attention back on South Yemen and finish what they started in March 2015. Where North Yemen killed over 2000 southern civilians in the space of 4 months. Stopping the Arab Coalition will not stop this war, in fact it will be even bloodier and there will be little or no coverage about it.